While the whole of Scripture functions in this manner, the Passover and the Passover Lamb are a focal point of such interpretation. Christ explicitly characterizes himself in the context of the Passover. The last supper enacts the Passover dinner and heightens its focal point by preparing us for and directing us to its ultimate reality. 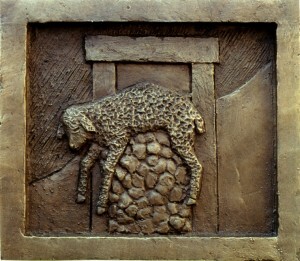 The Paschal Lamb is a type of Christ, who is the true lamb that takes away the sin of the world. Our focus is on the significance of the tenth plague. The terrible nature of this plague depends upon the fact that the first-born is counted precious. The plague exacts a punishment upon that which is dearest to us. Yet this terrible plague is the means by which God inaugurates the release of Israel. Revisiting their sin upon them, God finally persuades Pharaoh to let His people go. This is not to say that Egypt pays the price for Israel, but in Egypt we see what Israel would be without God’s provision. In the plague, Israel is granted a vision of what God has spared them from. God spares Israel, not by punishing Egypt, but in providing a lamb, thus showing them that “the Lord will provide” (Genesis 22). In the lamb, and finally in Christ, we see that Israel’s redemption is not Pharaoh’s work. It is accomplished by a more radical and, terrible and gracious sacrifice. The Exodus story sets God against Egypt and Pharaoh, but as the last post discussed, the tenth plague is a danger to Israel as well. Whereas the other plagues were localized, death is depicted as a universal threat. This is why Israel needs a Paschal offering and blood sign. Yet because Egypt is the guilty party in the Exodus story, the meaning of the Paschal offering remains obscure until the coming of Christ. In other words, Israel’s complicity has yet to be made clear. The meaning of the lamb and God’s radical love for us is hidden for a time in mystery. In Christ, it is shown that our redemption is not merely from external evil, but from our selves, from our own wrong doing and brokenness. In this light, the lamb and the firstborn take on new meaning. The firstborn put to death is Christ, the one and only (μονογενής) beloved of God. He is the firstborn and first fruit of God. If not for Christ, we would have none who could walk through the curse of death and survive. He is the only one whom the pangs of death could not hold (Acts 2:24). The first born is therefore simultaneously a type of Adam and a type of Christ. In as much as our natural life is of Adam we are subject to this plague. In as much as we are unregenerate and cling to our own first fruits, we are Egypt. Jesus was made sin that we might become the righteousness of God (2nd Cor. 5:21). Thus he took upon himself a likeness of Egypt, even as he remains Israel. He takes upon himself the likeness not only of Israelite sin, but the sin of all those who are to be grafted into his body. In this light, how does the death of the first born hearken to the coming of the Christ? The first-born serve to remind us of the necessity of his coming, of his gracious provision, and the high stakes. The Exodus hearkens back to Genesis 22, 37. But more significantly, it prepares us for the extraordinary mercy is made possible in the reality upon which each of these events depend.